I was feeling pretty crappy yesterday (having a rough month, if it wasn't already obvious) and I was hoping a hot shower would make me feel better. Usually some really good smelling soap cheers me up a little, but I just wasn't feeling it... and then I looked at my soap dish. My soap was smiling at me and I couldn't help but laugh about it. Hell, I even brought my camera into the shower to take a picture of it so I wouldn't forget how (eerily) cute it was. Message from the universe or weird soapy coincidence? I'll never know, but it sure made me smile too. 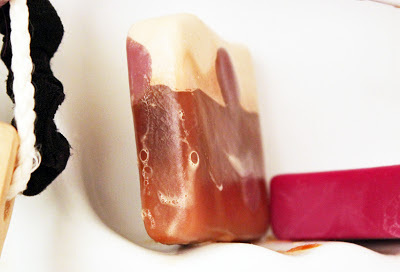 Your soap looks like a third stage navigator from Dune. Looks like Villainess's Birth Rite. Looks like Villainess's Birth Rite! PS: Read the latest post from Hyperbole and a Half to understand what Cloorn is. I am always on the look out for Cloorn and I think I tend to find Niblet Cloorn in lots of places. It'll do. I had beer tell me hi! Once and I took a picture. It's the little things. Happy soap! It's the little things that smile the hardest! Hehe. Just a few days ago I found myself taking a picture of a sad potato.